Bennche is perhaps best known for its utility vehicles used in conventional outdoor settings, but the company’s Spire 800 Side x Side is something completely different from those modes. The Spire 800 Side x Side is Bennche’s high-powered sport model, used more often in competition than in routine transportation of people and cargo between outdoor sites. The Spire stands out as one of the company’s most powerful models, as well as one of the few UTVs that are sold by Bennche as completely street-legal models ready to drive right alongside cars on the highway. Perhaps the most notable feature of this model is the engine that it keeps under the hood. Unlike traditional UTVs, which offer just enough power to travel safely at moderate speed, the Spire 800 Side x Side comes with a large and very powerful engine that can accelerate quickly and keep pace with regular vehicles on the road. 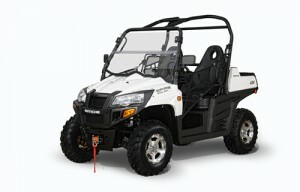 This UTV comes with an 800cc V-twin, 8-valve engine that can produce a stunning 55 horsepower. That’s more than twice the horsepower of an entry-level Bennche UTV sold for more conventional purposes, and it’s what makes this model such a competitive choice for those buyers involved in off-roading, extreme sports, mudding, and other competitions. The engine’s power is boosted by electronic fuel injection, an automatic transmission, and on-demand selection of ether two-wheel or four-wheel drive. In addition to the powerful engine that gives this model so much speed, the Spire 800 also comes with all the bells and whistles need to be considered street-legal. This includes a full windshield in the front, two rear-view mirrors on either side of the equipment, a central rear-view mirror, a loud horn and bright blinkers for indicating turns or lane shifts. This makes it easier than ever to transport the Spire 800 between locations, since it can be driven there instead of hauled or towed. That’s a must-have feature for today’s buyers, especially in competitive outdoor sports. One major benefit of the Spire 800’s street-legal features is that it comes with added safety features pre-installed. In many other UTVs, safety items are considered aftermarket accessories that can be added to the UTV as time and finances permit. Despite its larger overall size and more powerful engine, the Spire 800 Side x Side comes with the same fuel tank capacity as its much smaller and less powerful counterparts. Bennche has paired this model with a 7.6-gallon fuel tank, which is at least a third smaller than the fuel tanks found in compact cars. Because the Spire 800 is more powerful and a bit heavier than common UTVs, equipment buyers will likely find that their fuel economy suffers just a bit with this fuel tank. As a result, it’s a good idea to keep an eye on the fuel gauge and fill this model up before it takes any longer trips, especially if it’s going to be driving on roads or away from gas stations. Bennche’s Spire 800 Side x Side is a bit larger than it’s entry-level UTVs, but is still quite large and comfortable. This two-seat model features taller headrests that provide added support while driving, and has a larger cabin that allows for more room between occupants. All told, the Spire 800 measures 103 inches long and 52 inches wide, with a rather tall height of 74 inches. The equipment offers a 13-inch ground clearance and a more than 30-inch seat height, along with a 76.2-inch wheelbase. It weighs in at 1,165 pounds and offers a maximum towing capacity of up to 2,000 pounds. The small, rear cargo bed can hold up to 400 pounds of added gear and essentials. One thing to keep in mind is that the Spire 800 Side x Side already comes loaded with great safety features, which are must-haves if this model wishes to be declared street-legal. As a result, there are fewer accessories available for this model than for more conventional Bennche UTVs. Simply put, the most common accessories are already installed. With that said, the equipment can be paired with several different stereo roofs, giving it the ability to play CDs and MP3s over integrated, robust speakers above the occupants. This is a great way to add a bit of character and entertainment to the vehicle after purchase. Located in Chambersburg, PA, Shank’s Lawn Equipment is an excellent resource for Bennche UTV buyers. The company’s retail location in Pennsylvania combines with its online presence at ShanksLawn.com to make it easier than ever for interested UTV buyers to find their ideal model or their required replacement parts. With a wide selection of Bennche OEM parts and accessories, and helpful tips that make it easy to find the right UTV, ShanksLawn.com is a must-visit destination for both existing and aspiring Bennche owners. This entry was posted in Uncategorized and tagged Bennche UTV, OEM Replacement Parts, Shanks Lawn Equipment, Spire 800. Bookmark the permalink.